Enabling GENI Connections Quilt GENI Workshop Heidi Picher Dempsey July 22, 2010. 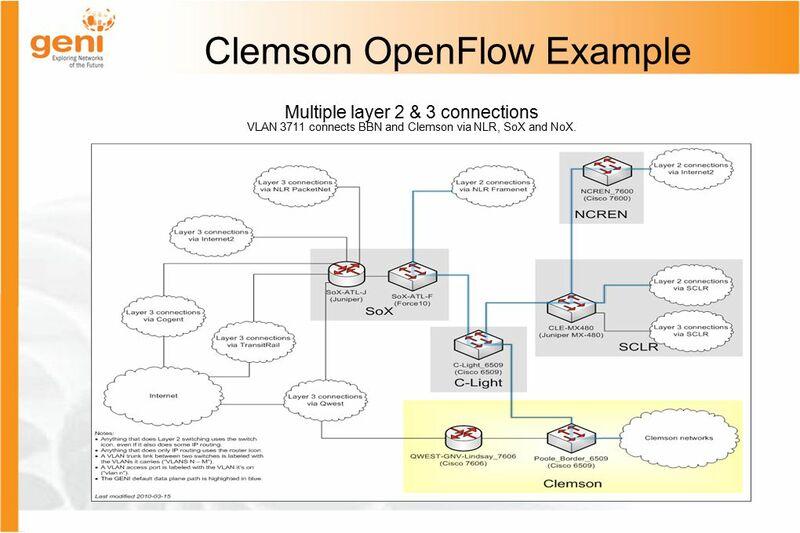 10 Clemson OpenFlow Example Multiple layer 2 & 3 connections VLAN 3711 connects BBN and Clemson via NLR, SoX and NoX. 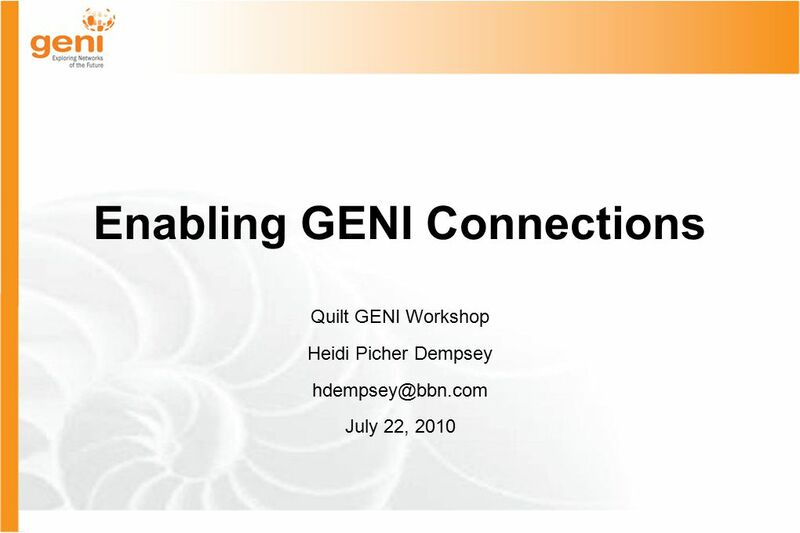 Download ppt "Enabling GENI Connections Quilt GENI Workshop Heidi Picher Dempsey July 22, 2010." 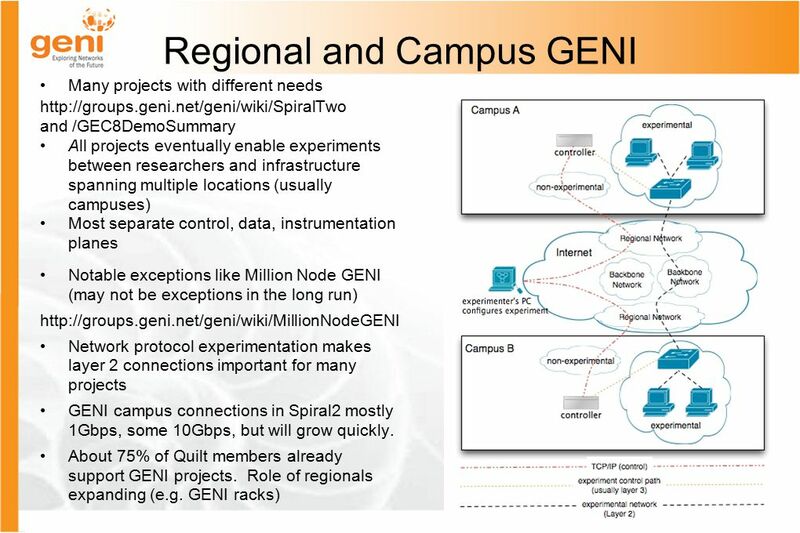 1 Spiral 1 Requirements Demonstrate GENI Clearinghouse & control framework in Spiral 1 projects as a central GENI concept. Demonstrate End-to-end. Openflow Demo at GEC-3 1. Demo Overview Demo is at GENI Engineering Conference III on October 28 th in Palo Alto, CA Extend the SIGCOMM’08 Demo of OpenFlow. 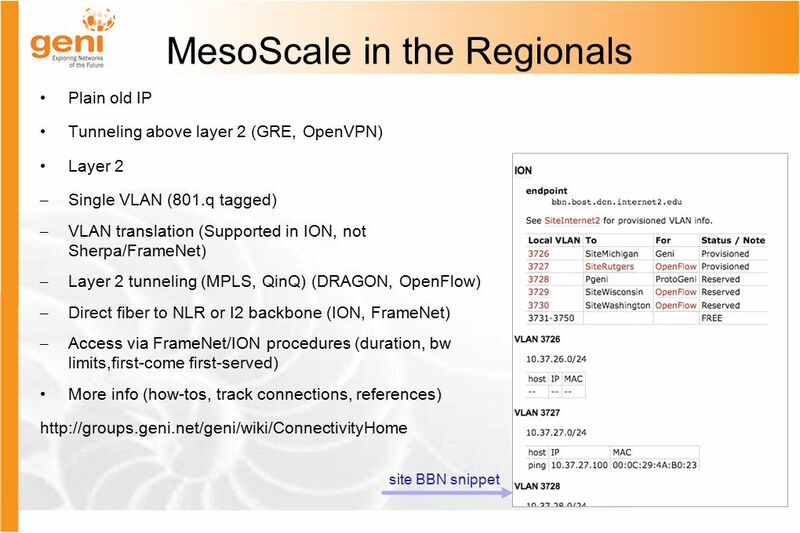 GENI Spiral 2 Meso-Scale Update GEC8 Heidi Picher Dempsey July 21, 2010. 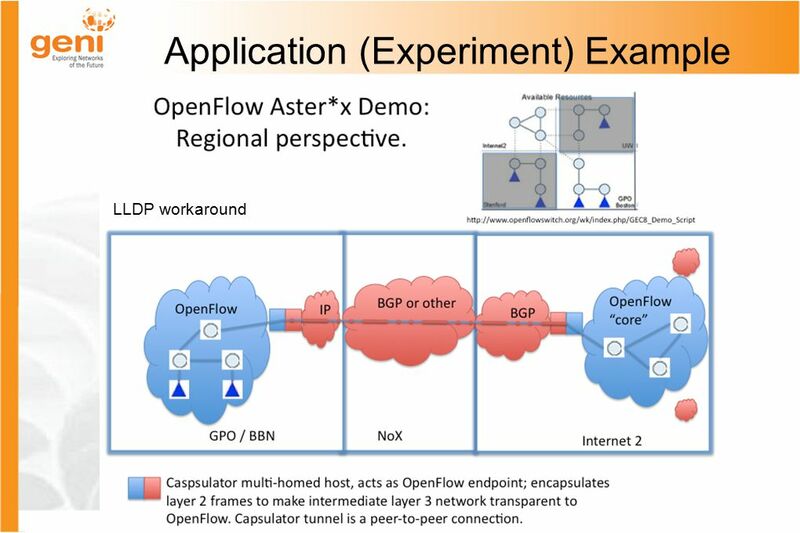 An Overview of OpenFlow Andrew Williams. 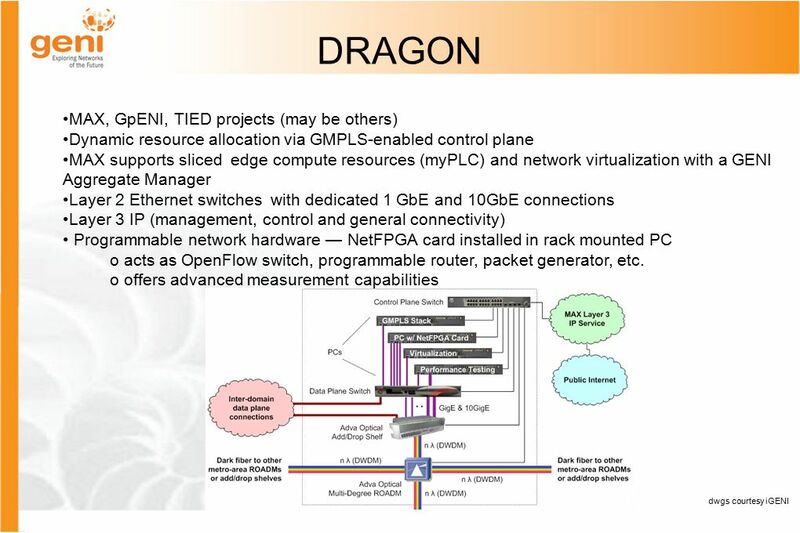 Agenda What is OpenFlow? 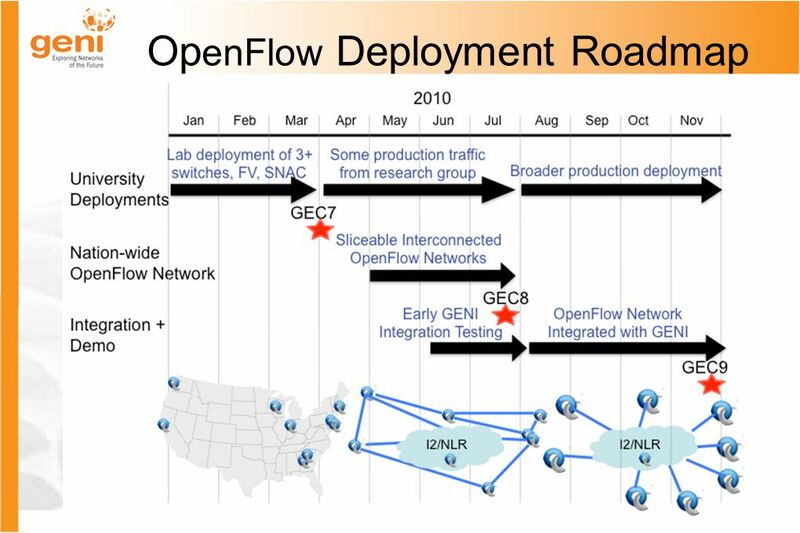 OpenFlow-enabled Projects Plans for a large-scale OpenFlow deployment through GENI OpenFlow. Sponsored by the National Science Foundation Experimentation using GENI Mark Berman GENI Project Office February 18, groups.geni.net. 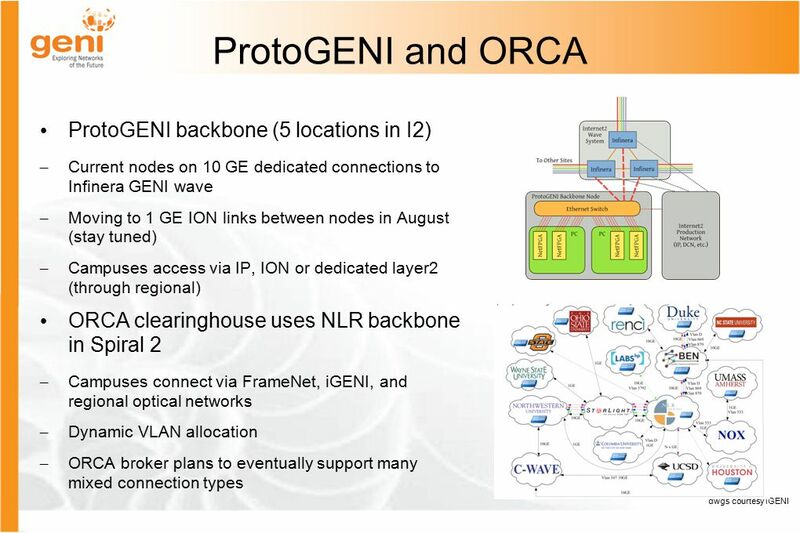 Sponsored by the National Science Foundation GENI Exploring Networks of the Future EDUCAUSE GENI Layer 2 / Software-Defined Networking Campus Deployment. 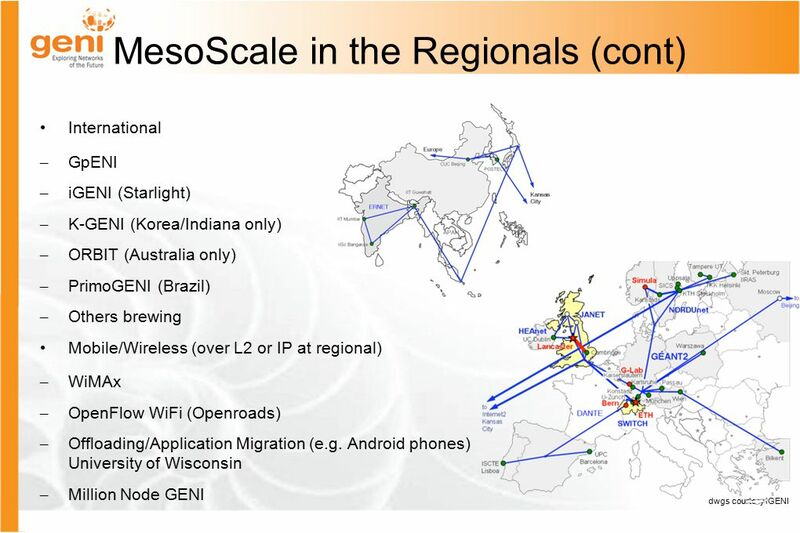 Kansei Connectivity Requirements: Campus Deployment Case Study Anish Arora/Wenjie Zeng, GENI Kansei Project Prasad Calyam, Ohio Supercomputer Center/OARnet. 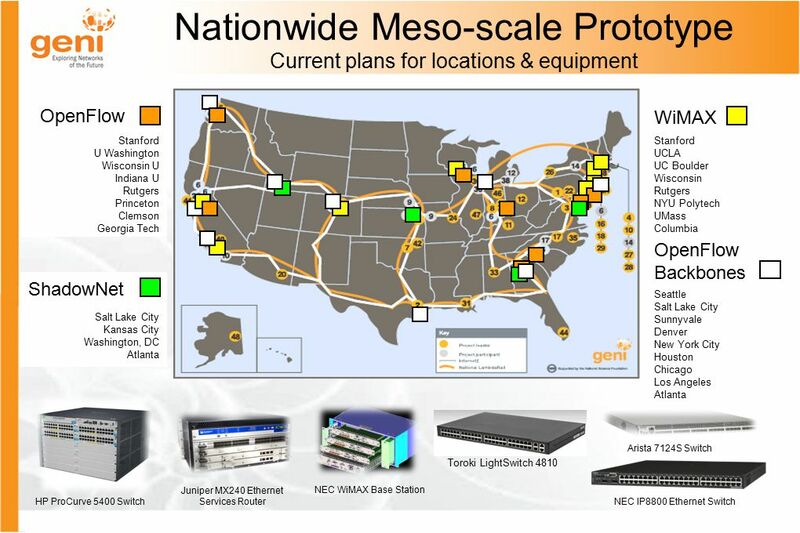 Internet2 Network: Convergence of Innovation, SDN, and Cloud Computing Eric Boyd Senior Director of Strategic Projects. Software-defined Networks October 2009 With Martin Casado and Scott Shenker And contributions from many others. Sponsored by the National Science Foundation Survey of Available GENI Resources Aaron Falk GENI Project Office 15 March 2011. 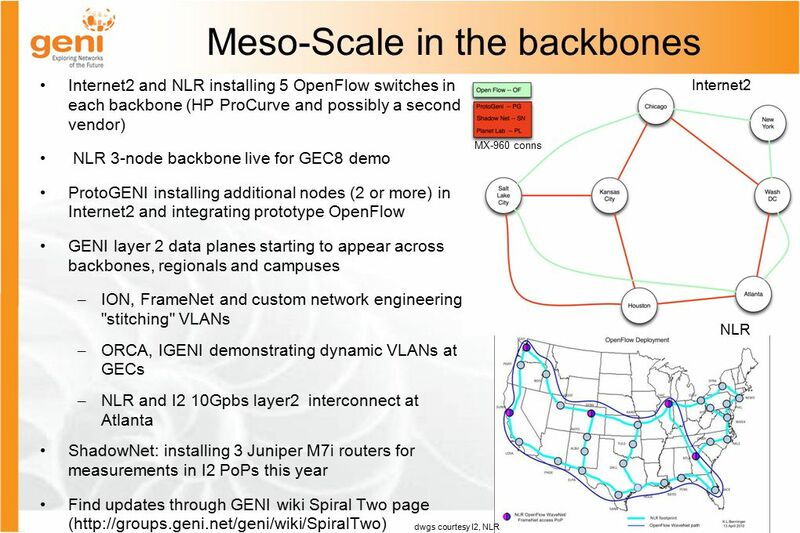 Sponsored by the National Science Foundation Internet2 OpenFlow Backbone Spiral 2 Year-end Project Review Internet2 PI: Eric Boyd Co-PI: Matt Zekauskas.